Flies: How Low Can You Go? 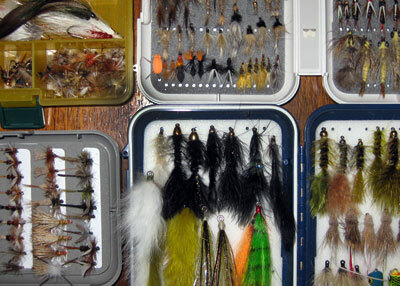 At the end of each season, I lay out my seven fly boxes (five freshwater, two salt) and get to work discarding, reorganizing and getting a sense of which patterns in the inventory need refreshing – or replacing altogether. About three seasons ago, muddlers, for reasons I still can’t figure out, were dismal performers (of course it couldn’t be my performance as an angler, ergo, it had to be the fly), so I intentionally let my muddler supply dwindle for the next two seasons. Bad move. I later learned that quite a few anglers were doing well with those flies. So I upped the muddler count last year to a very modest six flies. My flybox collection used to total ten. Then eight. Now seven, and I suspect it’ll hover near that mark for a few years at least. This got me thinking: How low can you go? The mathematical answer to that is simple: one fly, with or without the box. We’ve all read or heard about that select group of enigmatic fly fishers being able to make do with one pattern (a hares ear, usually) for the entire season. It’s certainly possible, but in my mind this amounts to nothing more than a philosophical exercise. There’s no question that those fortunate jet-setters who fish the entire planet need a vast assortment of bugs. Most of us, however, normally fish a handful of relatively local spots. So, how low can you go? The answer (my answer, of course) is four boxes. Medium-sized. Streamers, dry flies and nymphs get one box each. Wet flies and terrestrials have to share the real estate 60/40. North American waters can be covered with ten dry and ten wet fly patterns. This idea is supported by numerous “top-10 patterns” essays, and even in these articles there’s often overlap in the fly selection. The important thing to remember—and most of these lists don’t mention it—is having three sizes of each pattern: small/medium/large. On to streamers. I’m tempted to leave it at: ‘Black woolly bugger. Let’s move on to nymphs.’ But that would be a touch too simplistic, so add a few olive patterns, small, medium, large, with and without weight—with a slight balance given to the weighted patterns. If you target bass, weighted Clousers in brown/white and magenta/white should get some shelf space. If, and only if, you’ve experienced success with Mickey Finns and other dace patterns, then a few of those wouldn’t hurt. On to nymphs—hares ear, prince nymph, pheasant tail, scuds in dark, medium and light colors should all have a place. Same as streamers on style: weighted and unweighted, three sizes, and slightly favoring the weighted models. Some terrestrials, to keep those wet flies company. I know many anglers who do away with terrestrials altogether, but that’s just wrong. There are times when hoppers and ants—black and red—do what other flies can’t. If beetles populate your fishing locales, add beetles in the appropriate colours. Also ants in two sizes (small/medium), and hoppers in small/medium/large. There you are: four boxes are filled to about 80% capacity. Feel free send me an email outlining how that remaining 20% should be used. And if you’re partial to muddlers, do let me know the big secret to getting those flies to work—properly. I still don’t have very much faith in them.